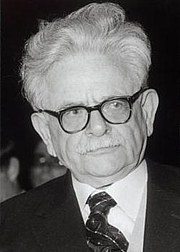 Elias Canetti was born in Bulgaria to a Jewish family. The family moved to Britain in 1911; to Vienna the following year; to Zürich in 1916; and then (until 1924) to Frankfurt, where Canetti graduated from high school. He learned to speak Ladino (his native language), Bulgarian, English, German, and French. In 1938, a few days after Kristallnacht, Canetti and his wife Veza escaped to London, where they received British citizenship in 1952. Veza died in 1963, and for his last 20 years, Canetti mostly lived in Zürich. Nearly all his writings were in German. Canetti won the Nobel Prize in Literature in 1981. Elias Canetti is currently considered a "single author." If one or more works are by a distinct, homonymous authors, go ahead and split the author. Elias Canetti is composed of 18 names. You can examine and separate out names.